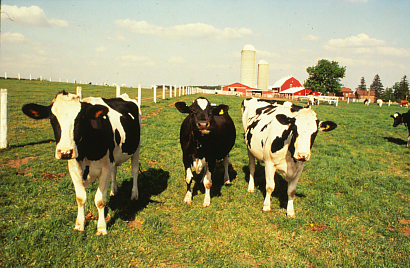 When you think about Dairy Science, what career opportunities come to mind? The obvious response may be dairy farm management but, in fact, a wide variety of employment opportunities exist due to the flexibility of program selection within the curriculum. While many graduates of dairy science own or manage profitable dairy operations, the majority of students seek employment in such challenging career areas as agribusiness, management, finance, biotechnology, veterinary medicine, marketing, sales, research, education, or dairy product manufacturing. Students majoring in dairy science pursue individualized programs designed to provide training for leadership and success in this extensive array of careers. Flexibility is accomplished by designing individual programs of study to provide a desirable balance among current and cutting edge technology, business management, and leadership development. A strong program with this balance can provide a variety of employment options, more flexibility in career selection, and the technical knowledge base critical to agriculture today and in the future. Some students prepare for postgraduate studies for positions in research and teaching. This preparation can provide a strong foundation leading to several emerging fields of biotechnology. Many students choose dairy science for pre professional training to prepare for entrance into colleges of veterinary or human medicine and law. The curriculum hosts the Dairy Science Club, one of the most active and recognized organizations on campus. The club provides leadership development opportunities, extracurricular activities, and friendships that will last a lifetime.